Ground water is among the Nation's most important natural resources. It provides half our drinking water and is essential to the vitality of agriculture and industry, as well as to the health of rivers, wetlands, and estuaries throughout the country. Large-scale development of ground-water resources with accompanying declines in ground-water levels and other effects of pumping has led to concerns about the future availability of ground water to meet domestic, agricultural, industrial, and environmental needs. The challenges in determining ground-water availability are many. 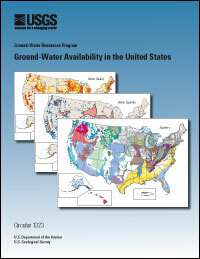 This report examines what is known about the Nation's ground-water availability and outlines a program of study by the U.S. Geological Survey Ground-Water Resources Program to improve our understanding of ground-water availability in major aquifers across the Nation. The approach is designed to provide useful regional information for State and local agencies who manage ground-water resources, while providing the building blocks for a national assessment. The report is written for a wide audience interested or involved in the management, protection, and sustainable use of the Nation's water resources. What Do We Know About Ground-Water Availability in the United States? For more information, please contact Thomas E. Reilly.